It was four in the afternoon: three hours, I reminded myself, into my reading of Robert Lukins’ debut novel, The Everlasting Sunday, when the edges of wakefulness retreated and I sunk into a wintry slumber.^ Like Radford, the seventeen year-old we follow through the events of a deep English winter in 1962, I was referred to by surname only; a moniker afforded in the unending anticipation of adulthood. “Currie”, it seemed, was a boy who had been ‘found by trouble’ and sent to Goodwin Manor. That trouble and the final straw that sealed my fate seems to have slipped away, just out of reach. It was all in the past now, so what did it matter? 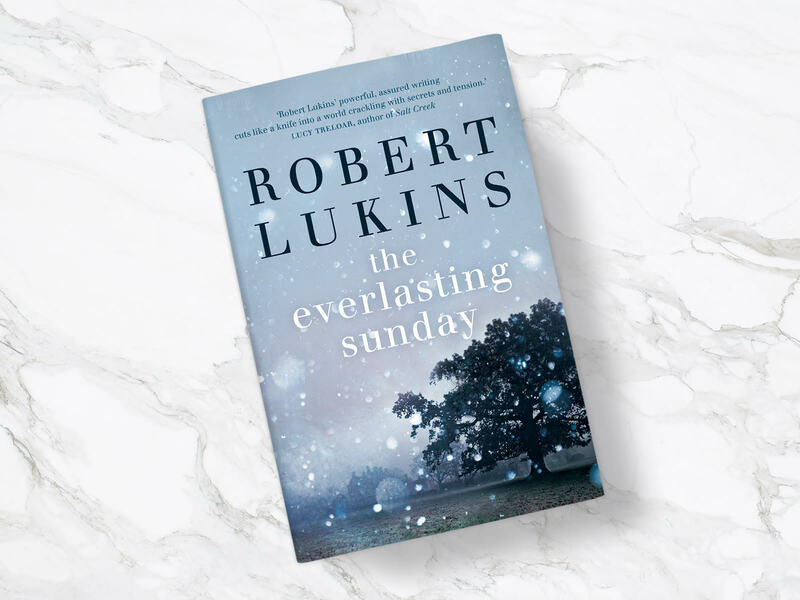 The assuredness of this debut suggests there are half a dozen manuscripts sitting in Robert Lukins’ desk drawer waiting for the readers they deserve. He has crafted a tense survival story in The Everlasting Sunday; here we have a manor filled with troubled boys thrown together by circumstance with minimal supervision or structure. But what results is not a Lord of the Flies experience. We are not surprised by the savagery of the boys, but by unexpected kindnesses, vulnerability and the fragility of friendships that are at once too deep to express and shallow enough to shatter at the thought of what remains unsaid. Atmosphere is forefront in this novel, which read to me like I imagine a snow-globe might: it conserves a feeling or moment in time, one that looks peaceful at first but is shaken into turmoil by a cast of characters with unsettling and unspoken histories. The sense of place is strong, but never settled enough for one (be it a character or a reader) to feel at home there, as there is a continuing sense that Goodwin Manor may simply slide into the deep winter beyond. Like Radford, “Currie” fluttered around the charismatic West like a moth. Together we had broken away to the belfry, and for three cigarettes and half a bottle we danced around the light, probing deeper and retreating when the truth of things seemed too close. Now alone, “Currie” waited, still and long enough for snow to litter ‘his’ hair, now released from its secretive braid. After some consideration, the world beyond the Manor seemed to grow several shades brighter and I pounded at the snow with my feet until I came to rest beneath a square of night that went on forever. Below my feet: nothing. I had found the edge. The edge of belonging to family / the manor / society / prison / winter. The edge of adulthood / manhood. The edge of sanity. The edge of civility. It is with a classical and rhythmic command of the English language that Lukins explores the edges of many things, each adding to build a haunting movement of time. Teddy, the Manor’s pragmatic administrator, is perhaps the most slippery of all, with his many edges “retreating into steam” whenever flirting with clarity. Lukins’ prose is beautiful, dancing from the page to the reader’s mind’s eye with ease. His ability to bring vivid life to an isolated setting reminded me of Hannah Kent’s Burial Rites, and the personification of winter as a menacing character had me thinking back to the way Anna Spargo-Ryan characterised mental illness in The Paper House. “Currie” fell, everlasting. However invisibly, this book / this dream was connected to the secondary world, and I had tugged on that line. I kicked my beloved companion in the thigh as I fell, twice, three times. He flinched with each blow and raised a palm, seeming to beg. I was lost in the memory of a dream with no edges but for the one from which I fell. The picture was absurd, even to imagine, but there I was, a poor reader on a warm February afternoon shivering on the couch in the memory of a haunting English winter. The Everlasting Sunday is a beautiful read, and while I can’t guarantee that you’ll dream yourself into it like I did, I do expect you’ll be captivated by its tense setting and rich and volatile characters. Do yourself a favour, etc. ^ Apologies to the author for butchering your beautiful prose in aid of this review - I couldn’t help myself!